March 21, 2019, 4:24 PM · Welcome to "For the Record," Violinist.com's weekly roundup of new releases of recordings by violinists, violists, cellists and other classical musicians. We hope it helps you keep track of your favorite artists, as well as find some new ones to add to your listening! Jazz violinist Jason Anick. Photo by Sasha Israel. 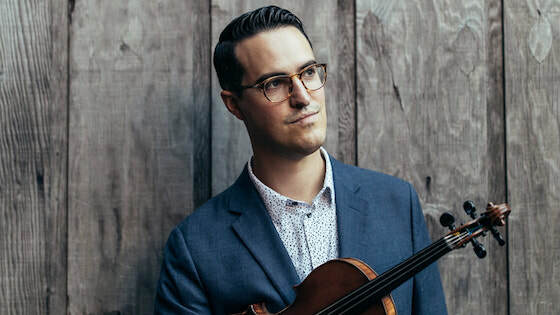 March 21, 2019 at 11:19 PM · Wow for Jason Anick and his quartet! Thanks for calling that to our attention. Despite my best efforts, there's so much great music going on that I've never heard before. March 22, 2019 at 02:15 AM · Normally I'm not much of a gypsy-jazz fan but this is really great stuff. Fantastic ensemble work -- very tight -- and outstanding solos. Make no mistake -- this guy has a professional classical technique underpinning those jazz licks. To those interested in learning jazz -- listen carefully for arpeggios and other patterns. Those are common improv elements. And it's not difficult to analyze in a tune like this because, frankly, it's relatively harmonically limited music. Laurie -- any information that you can give us on getting access (even if paid) to the lead sheet for that tune would be warmly appreciated.